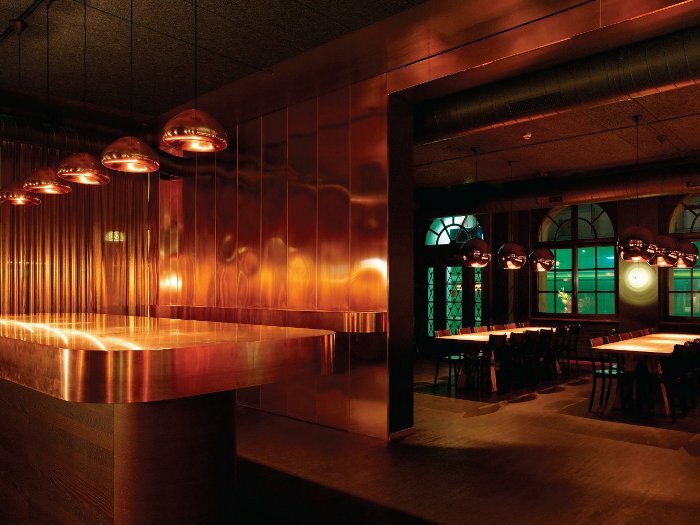 For the three months she spent designing and overseeing the fit-out of the Union restaurant in Basel, Switzerland, local architect Aurélie Blanchard says she became obsessed with copper. 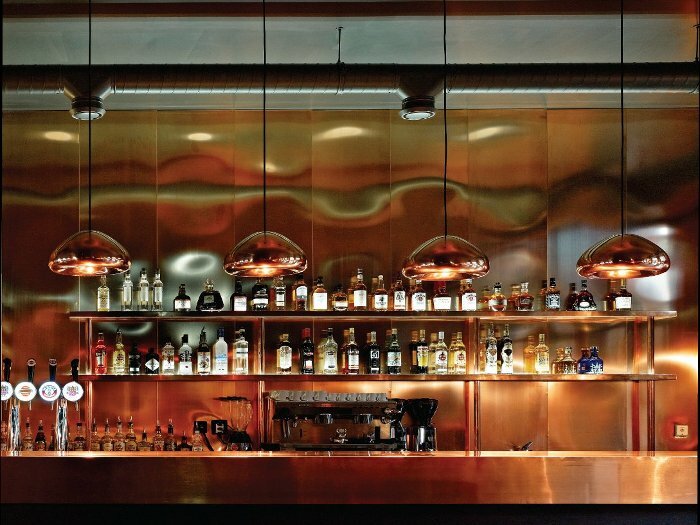 The material covers almost every surface of the restaurant's bar-room; copper lights by British designer Tom Dixon - including his famous Copper Pendant Light - hang from the ceiling or are mounted on copper-lined walls; and there are even copper vases on the tables, which Blanchard collected from flea markets around the world. Surprisingly, though, copper was not the starting point for this project. Instead Blanchard, who recently set up her own practice after five years with Herzog & de Meuron, took her inspiration from a shade of green traditionally used to paint the front doors of Basel's houses. 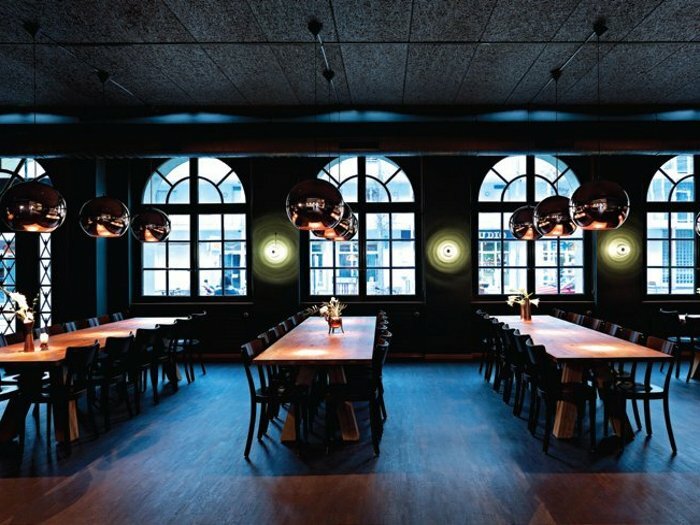 'First came the idea of painting the restaurant room in a very dark, matt green,' says Blanchard. 'It makes the large room feel cosier and refers to the traditional colour of Basel's front doors. Then I wanted a strong contrast for the bar space so I looked for something warm and glowing. Copper came quickly to mind. Timber also plays a starring role in this scheme, particularly dark walnut, which has been used to make standing-height tables and a large central table for the restaurant. These have then been covered in copper sheeting and have chamfered edges. The same dark walnut is also used to board the floor. 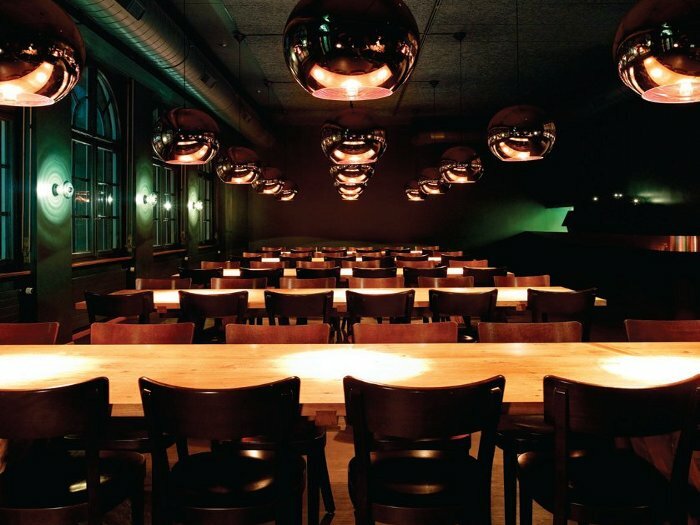 The dining tables - practically the only readymade furniture in the whole scheme - came from Van Rossum Design, but Blanchard asked that they be made longer than the standard model in order to fit the large scale of the restaurant.